HOUSTON — The countdown clock is running again for astronaut Donald E. Williams’s first Shuttle flight, but with the experience of two cancelled flights in the last ten months, he’s wary of taking too much for granted. “Bo (Commander Karol Bobko) has been telling us we can believe it’s real when the solid rocket boosters light,” said the 43-year-old Williams, who will serve as pilot for April’s 51-D mission. Williams, a native of Lafayette, Ind., is married to the former Linda Jo Grubaugh of Sturgis, Mich.. The couple has two children, Jonathan, 10, and Barbara, 8. William’s’ mother-in-law, Mrs. Herbert Grubaugh, resides in Howe, Ind. A graduate of the Navy ROTC program at Purdue University, Williams flew 330 combat missions over Vietnam before becoming a Navy test pilot. 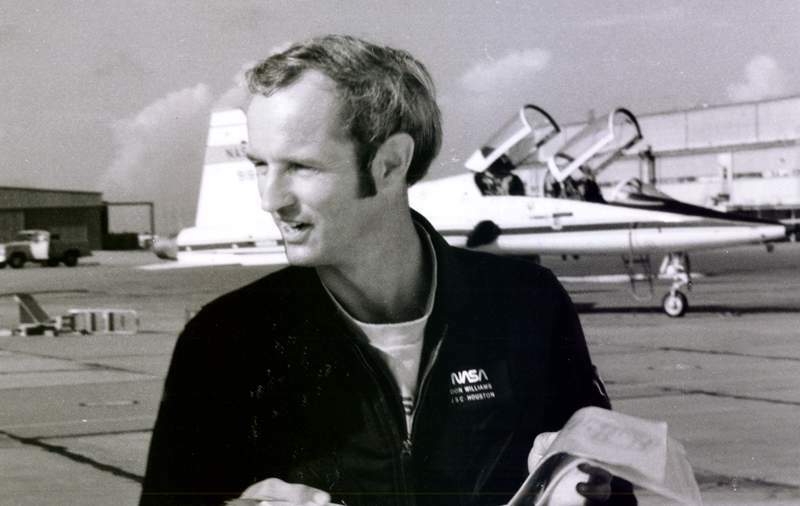 After being selected as an astronaut in 1978, Williams served in several technical assignments before being tabbed for a Shuttle flight planned for August, 1984. In addition to Bobko and Williams, the crew included mission specialists Rhea Seddon, Jeffrey Hoffman, and S. David Griggs. 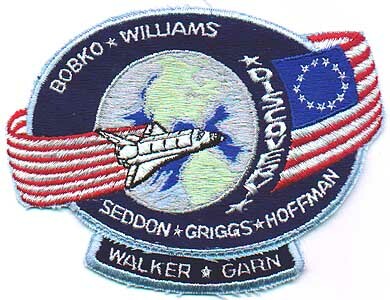 That mission was cancelled in the wake of the dramatic on-the-pad abort of flight 41-D, and Williams’s crew was reassigned to a February, 1985 flight. Problems in a NASA communications satellite led to a second cancellation. The new plan places Williams’s crew, plus payload specialists E.J. “Jake” Garn (U.S. Senate) and Charles D. Walker (McDonnell Douglas), aboard the orbiter Discovery for a five-day mission scheduled to begin April 12. The payload consists of a Canadian “Anik” communications satellite, a Navy Syncom IV satellite, and Walker’s drug-purification apparatus. Williams’s immediate family, his parents, and Mrs. Grubaugh are all expected to be on hand in Florida for the liftoff. “Linda’s mom had planned to drive down with some relatives when we were going to launch in February. They had already left when the flight was cancelled, so they just went ahead and had a vacation anyway,” Williams said. This time, Mrs. Grubaugh plans to join her daughter and grandchildren in Houston before flying on to Florida. As pilot, Williams’s most crucial responsibilities come during what he calls the “dynamic phases of the flight”: the ascent and reentry. That emphasis is reflected in the training schedule. “We try to fly one ascent sim(ulation) a week, minimum,” Williams said. 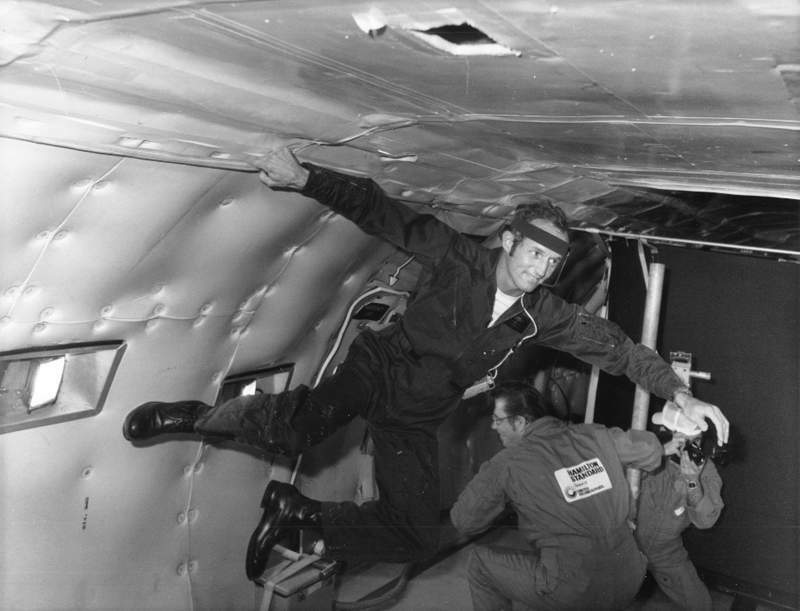 “In a four hour period, we’ll make about seven or eight runs and exercise all kinds of failures that could occur in all the systems during that period of time.” Bobko and Williams also have a weekly appointment with the Shuttle Training Aircraft, a Gulfstream modified to handle like a gliding Shuttle orbiter. However, on the 51-D flight every member of the crew will take some time out from other duties to play with tops, yo-yos, paper airplanes, and other simple toys. The goal of the Houston Museum of Natural Science’s “Toys in Space” project is to enhance the teaching of physics in elementary and junior high school children. “We’re all looking forward to seeing how some of those things behave, and hopefully the end product (a videotape) will be worthwhile. There was some of this done a long time ago on Skylab, and that’s still one of the most requested pieces of educational material to come out of NASA,” Williams noted. A successful flight in April will not exhaust Williams’s ambitions with NASA. One future goal is connected with the new Shuttle launch site in southern California, which will become operational next year. “The Vandenberg flights will be in polar orbit, which is going to be a just absolutely terrific chance to see the entire surface of the earth,” he explained. 2005 Update: Donald E. Williams finally reached orbit aboard Discovery on mission STS-51D, April 12-19,1985. 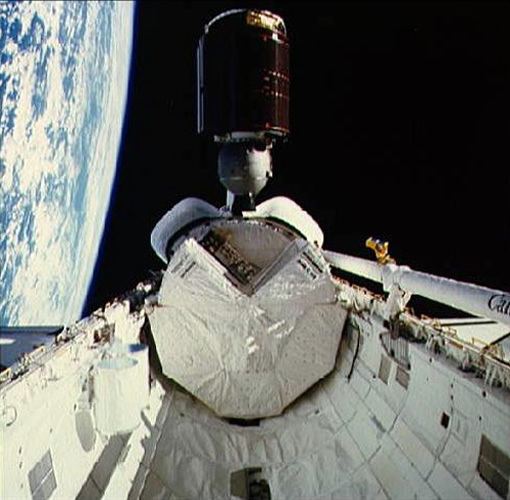 The Air Force ended its plans for manned polar-orbit Shuttle launches from Vandenberg after the January 28, 1986 accident which destroyed Challenger, and the SLC-6 launch complex was converted for unmanned Delta and Athena rockets. Williams went on to command STS-34 in October, 1989, pushing his time on orbit to over 287 hours. He resigned from the astronaut corps in March 1990 to take a position in the aerospace industry. Space Station Freedom, designed in response to Reagan’s directive of January 1984, underwent four major redesigns before being cancelled in 1993; the first module of its successor, International Space Station Alpha, was finally placed in orbit in late 1998, and the station was occupied for the first time in November 2000.